So, you may not be a gym fanatic and spend a substantial amount of time at the gym or spent the morning running around the local estate. However, like most people in this modern fast growing technological society you are likely to have a smartphone of some sort. The fitness industry is a fast-growing market with the number of UK Fitness Members exceeding 9 million for the first time ever! With it being so evident that this is a growing market, the number of fitness mobile applications are rising in conjunction with this. Have you noticed that there are more runners out on the street that have some form of fitness tracker? It turns out there is a good reason for this as people feel more engaged with health as they now can track their fitness, set goals and monitor how often they train. Now although fitness wristbands are a growing market, not everyone has one! Smartphones however is a continually fast moving environment with billions of people all around the world downloading apps daily. Mobile apps are useful for so many aspects in life, from fitness tracking to social media interaction. This is a market that is likely to continue to grow for many years across all mobile platforms. There are a wide range of makes of fitness wristbands, however at Fan Fit, we believe that fitness mobile application are the way forward. The total time spent by people on digital media is exploding right now with so many new mobile applications entering the market, on both major platforms; Apple and Android. Over the past few years, the total digital media usage has significantly increased by around 49 percent, with mobile app usage up by 90 percent according to comScore’s 2016 Mobile App Report. 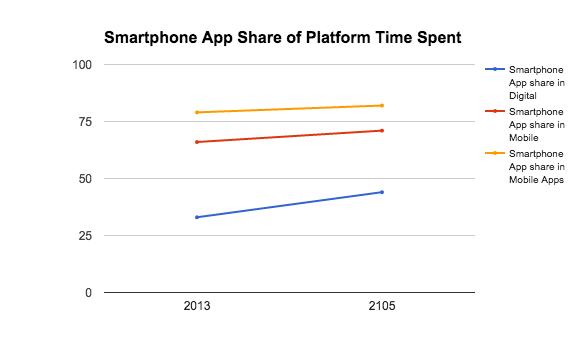 The chart below indicated the app share has increased between 2013 and 2015. So, this seemed fitting that we should put together some form of fitness mobile app, that not only tracks your data but allows you to compete against your friends and favourite sports club – which is why Fan Fit was developed. What is Fan Fit? This is a smartphone app that aids fans and sports clubs communication with each other, as well as encourage them to think more about an active, healthy lifestyle. The app is aimed at using just a simple mobile app to help empower fans, whether they be fitness fanatic or someone who is just starting out. One of the main features of app is that it can be re branded to a club’s signature colours. This was developed after intensive research at the University of Salford, allowing fans to even track their fitness against their friends.